REGISTER AT BOTTOM OF PAGE. WHAT: Tubing down the Namekagon river for MONDAY MADNESS! 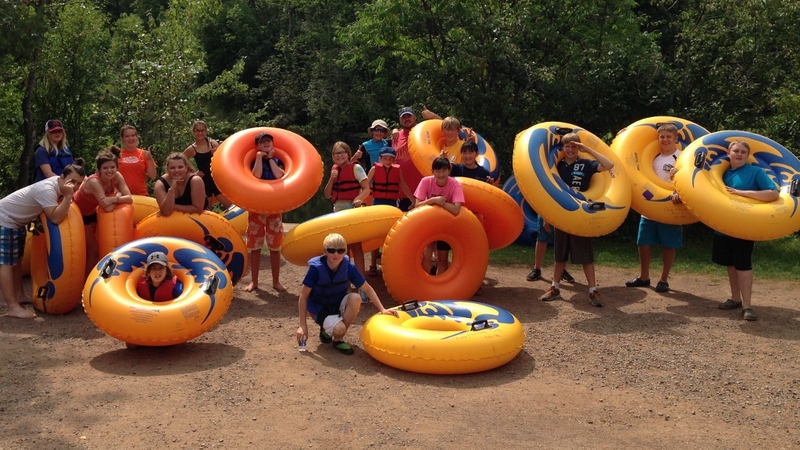 (For more info about Tubing the Namekagon, CLICK HERE!) WHEN: July 31st, and the bus leaves at 9 am. ( Students please arrive at 8:45am). Return at 5:30. COST: $13 WHO? All Students going into 6th thru 12th grade (to include those who just graduated.) College age students are welcome as well…but we will put you to work! WHERE: Meet at Journey Christian Church, then we will drive to Camp Namekagon in Springbrook Wi. Bring: -A modest swimsuit. (Girls: one piece or a t-shirt to cover two piece, and shorts are recommended. Guys- No Speedo.) -Water shoes are recommended as the bottom of the river is rocky in places. (Old tennis shoes work. Flip flops tend to float away. So wear shoes or a footwear that are strapped to your feet.) -Towel -Change of clothes (you may not want to ride in the bus for an hour and a half back with wet tooshie) -Sunscreen!!!! – a hat, and sun glasses. If you have special dietary needs, we request that you pack your own lunch as we cannot easily accommodate everyone’s special needs. Thanks! If you have any other questions, Email Ben Salmi, Youth Director at Ben@cloquetchurch.com. Or call 218.879.6765.